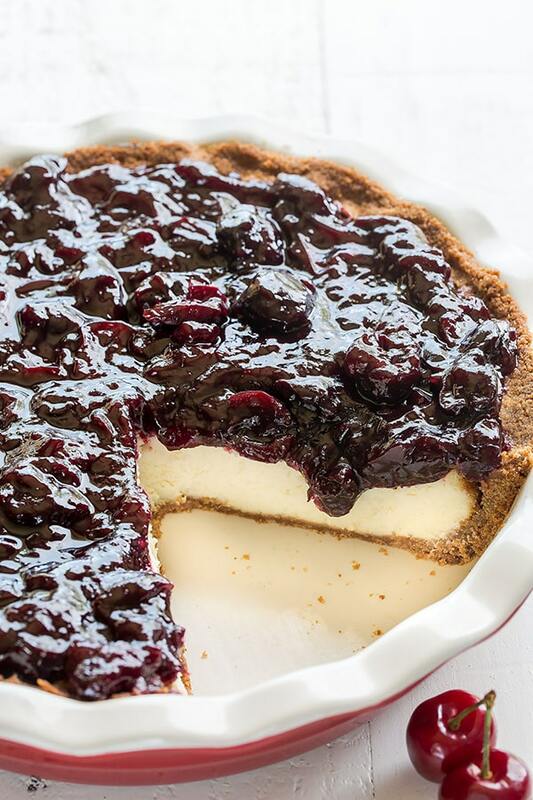 Nothing is better than a slice of creamy cheesecake, unless it’s topped with delicious cherry pie filling. 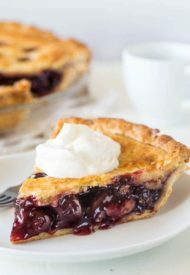 For the best flavor, make the cherry pie filling from scratch. It’s incredibly easy!! My husband recently came home with not one, but TWO bags of fresh sweet cherries!!! Man knows his pregnant wife’s cravings! It was such a pleasant surprise too, because I had no idea that cherries were out on the shelves. Hooray for cherry season!!! 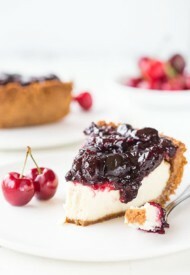 The fresh cherries got me craving cherry pie, then it morphed into cherry cheesecake craving. What can I say, cravings lead to delicious desserts. It was so good, I couldn’t not to share it with you. 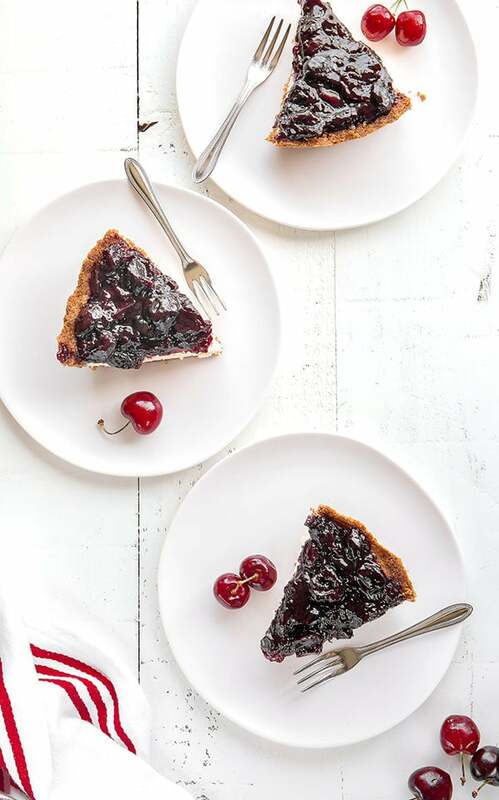 Confession: under the name of “recipe testing” I made this cherry cheesecake pie multiple times. Yeah, it may seem like I just combined the two desserts into one (no brainer! ), but I did play around with the recipe a little bit. I used frozen cherries for the pie filling, but I thought it’d be a great idea to incorporate fresh cherries into the cheesecake batter. Though it tasted pretty delicious, the appearance of the cheesecake was less than pleasant. Who knew, beautiful white cheesecake batter mixed with pureed cherry turns into a murky unpleasant cheesecake. 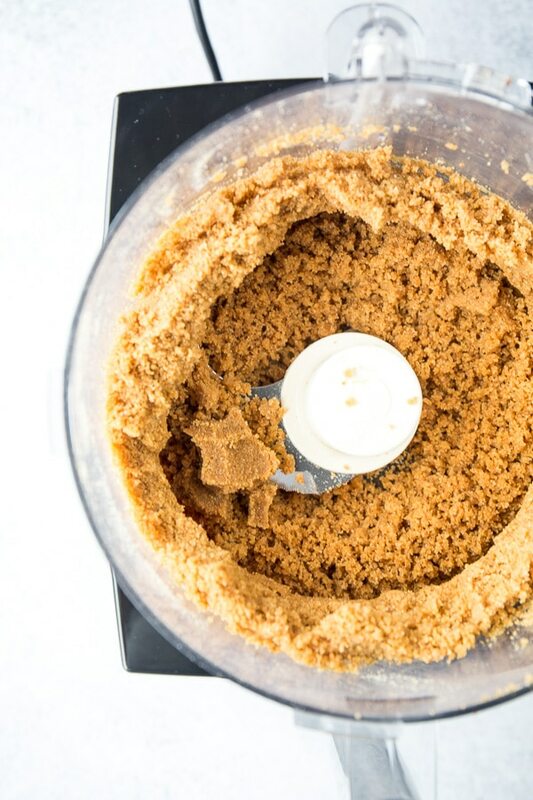 To make the crust, in a food processor process graham crackers until fine crumbs form. Add sugar and melted butter and pulse until the crumbs are evenly moistened. 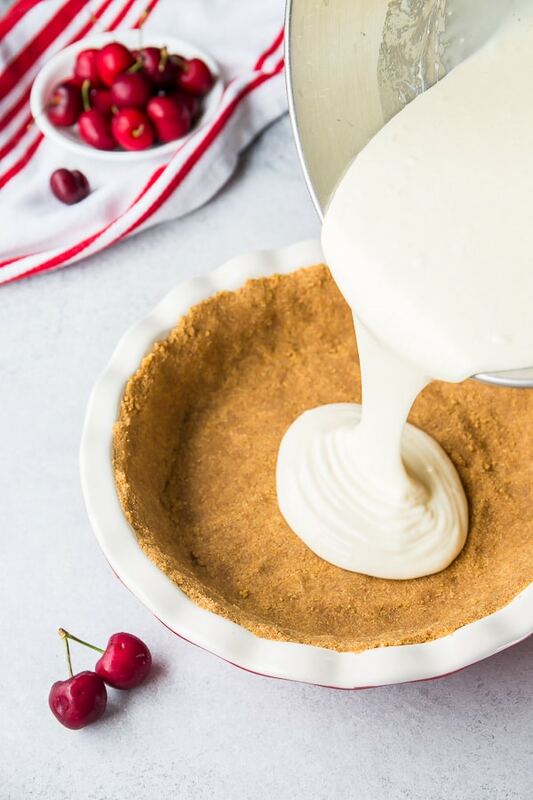 Transfer the crumbs into a 9-inch pie pan. Press the mixture onto the bottom and up the sides of the pan. Refrigerate while working on filling. To make the cheesecake filling, in a mixing bowl with paddle attachment, beat the cream cheese until nice and fluffy on medium speed, about 2 minutes. 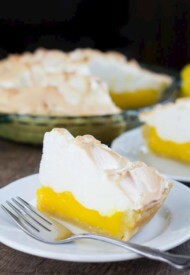 Add sweetened condensed milk, eggs, flour, lemon juice, vanilla extract and salt. Continue to mix until well combined. 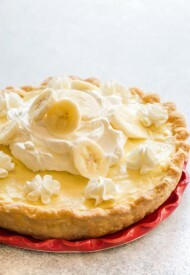 Pour the cheesecake mixture into the prepared pie crust. Bake it for 45-50 minutes, or until the edges are set and slightly wobbly in the center. Cool on wire rack for 2 hours. Then refrigerate to set completely for at least another 2 hours. Reduce the heat to low and simmer the cherry mixture stirring frequently until thickened, for 4-5 minutes. Remove from heat and cool for a few minutes. Cover with plastic wrap and refrigerate until ready to assemble.